The conference will include a special session dedicated to Prof. Mariano Gasca on the occasion of his retirement. 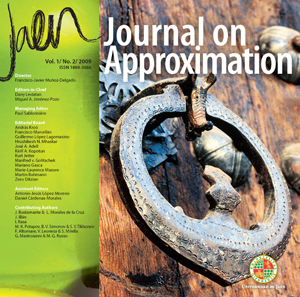 Prof. Mariano Gasca, a relevant Spanish mathematician, is very related to Jaen, for instance, he was the first Director of the Jaen branch of the University of Granada, he is a member of the editorial board of Jaen Journal on Approximation, member of the Scientific Committee of Ubeda Meeting on Approximation and he has many academic descendants in Jaen. Consult the list of 'descendants' of Professor Gasca by means of the Mathematics Genealogy Project web site.